This is a colour combination I keep coming back to time and time again. And so is the long stitch structure, as it not only looks really nice but it allows me to easily adjust the spacing between the pages. 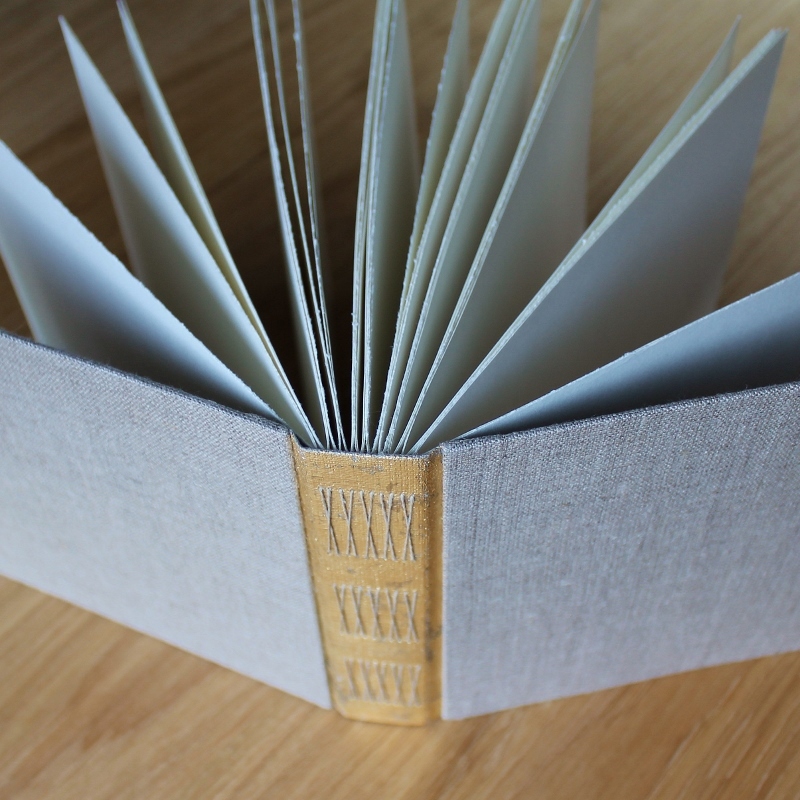 Meaning, it's a great way to create an album that beautifully accommodates a stack of photos, or a great number of collaged pages in an art journal, without beginning to bulge at the fore-edge. You can find both albums in my shop. And anyway, I usher you to take a look what else is there - since from the perspective of most of you guys I live in a rather remote corner of the world, it's a good moment to start thinking about holiday shopping should you want something extra special paper treasures delivered to you in time from Finland. I'm writing this post from a Wednesday night dance party for one. It's reasonable to say my new home is a bit chilly, so after a couple of hours of procrastinating by the laptop, some movement was needed to get this long-stitch photo album thing rolling. Festive books require a festive mood? Not sure, but the photos have finally been uploaded and the albums can be found in the shop. So let's just look at them for a while in moderate awe (I'm an eternal fan of leaf metal and linen). We're getting to enjoy a rare treat here in Helsinki at the moment - there's a beautiful artists' book exhibition in Galleria Katariina until the 12th of November. I've stopped by twice already, and hope to share a bit with you next week, once I've managed to go through all the photos I took today! This harebell notebook is a distant cousin of the vellum notebook dating back to February. This one's much more delicate, smaller, lighter, more translucent. 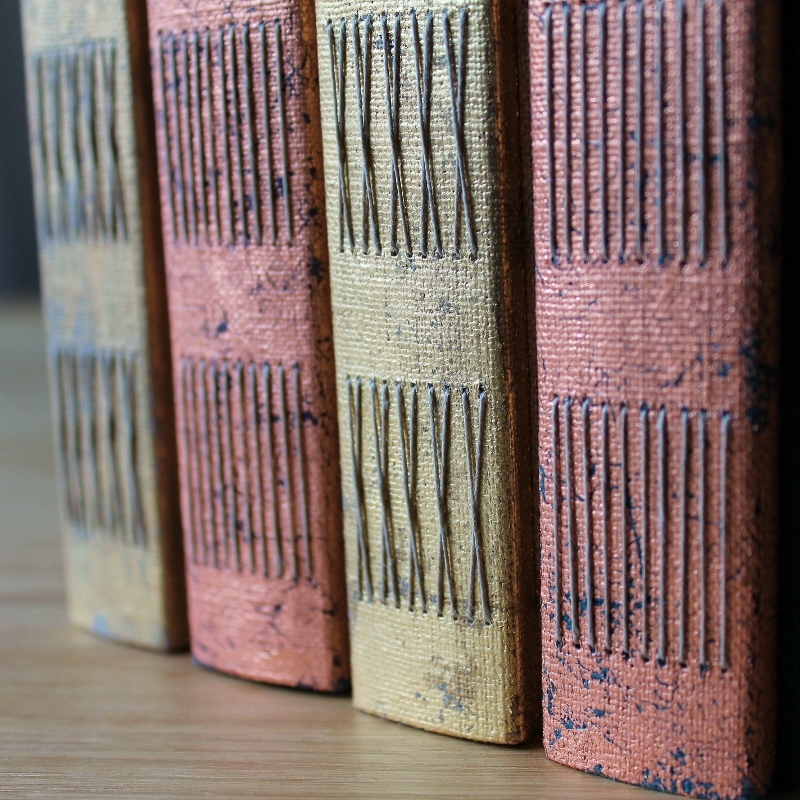 The covers are made with vintage school book illustrations and waxed lokta paper, and the spine is a sliver of an antique vellum document. 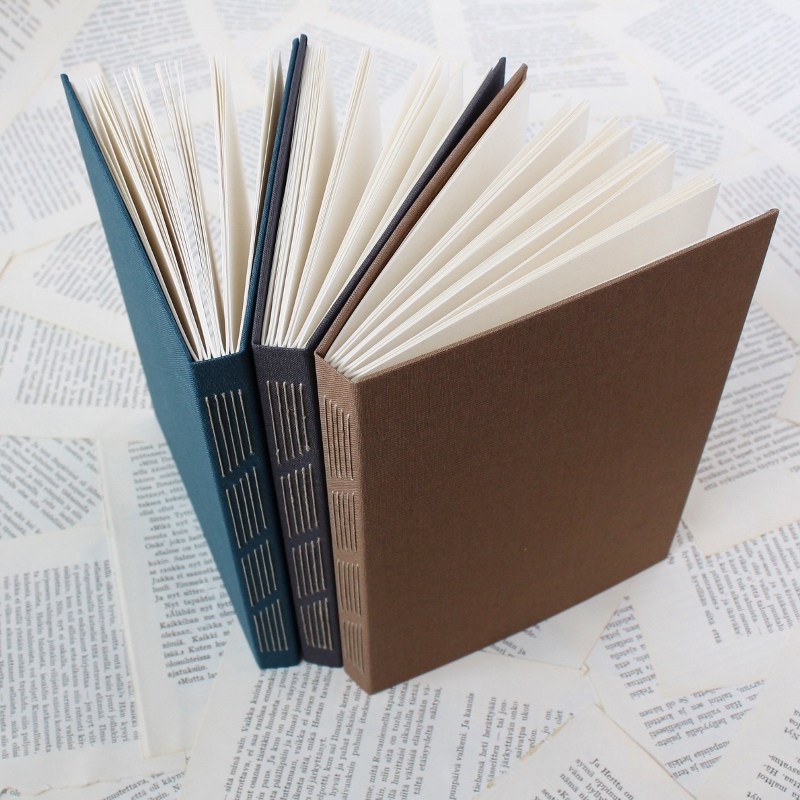 The pages are a mixed lot - off-white drawing paper in 100gsm and 150gsm and a few vellum paper pages with an occasional foldout thrown in the mix. I actually wish I could see what this book looks like once it's been put to good use! If you feel like you know just the right person to fill this with scribbles, it's available in my shop. Helsinki ended up being just the thing I needed - a special artists' book treat followed by solitude and new neighbourhoods to explore on my long walks. A change in scenery often helps us rearrange the self. And as a result I'm also in dire need of a new journal! The floral journal I made for myself has now been in use just over a month and there are under ten pages left for me to fill with my tiny-ant-handwriting (reserved for journals and anxiety-ridden teenage-letters). I think I'm going to stick with the same size and binding for the next journals, since one of the reasons this has filled up so quickly is the lack of excuses for carrying it with me everywhere I go. And given that I apparently go through a journal a month, I might as well make a few in one go. Easter plans: sorted. For the rest of you, I already have some new books in stock. These are just a tiny bit skewed - on purpose, of course. 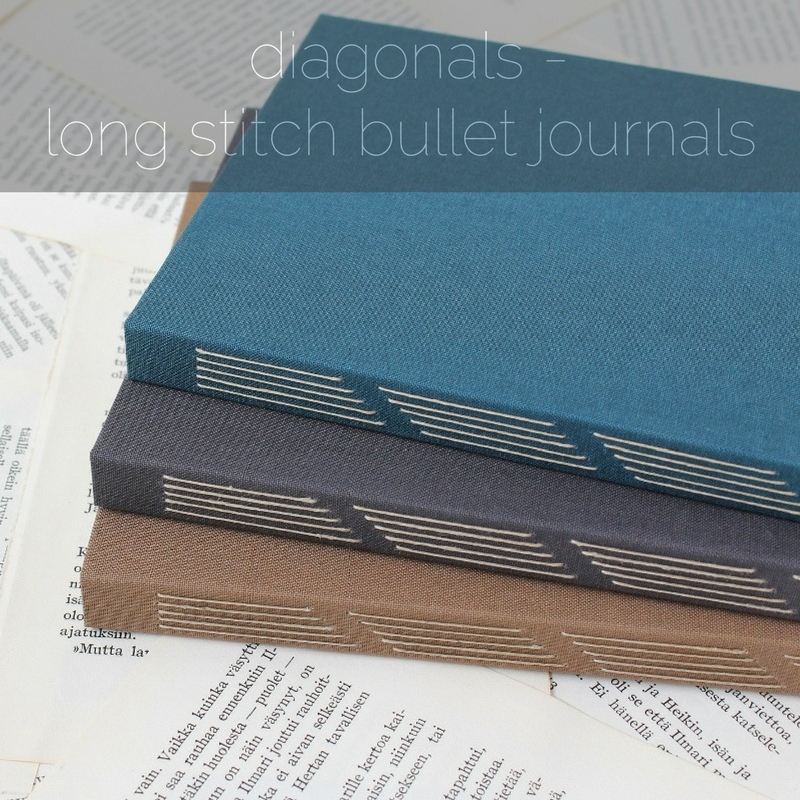 These notebooks have 100 dotted grid pages each and a diagonal pattern long stitch binding. Even the slightest change in the expected can be a powerful design element. 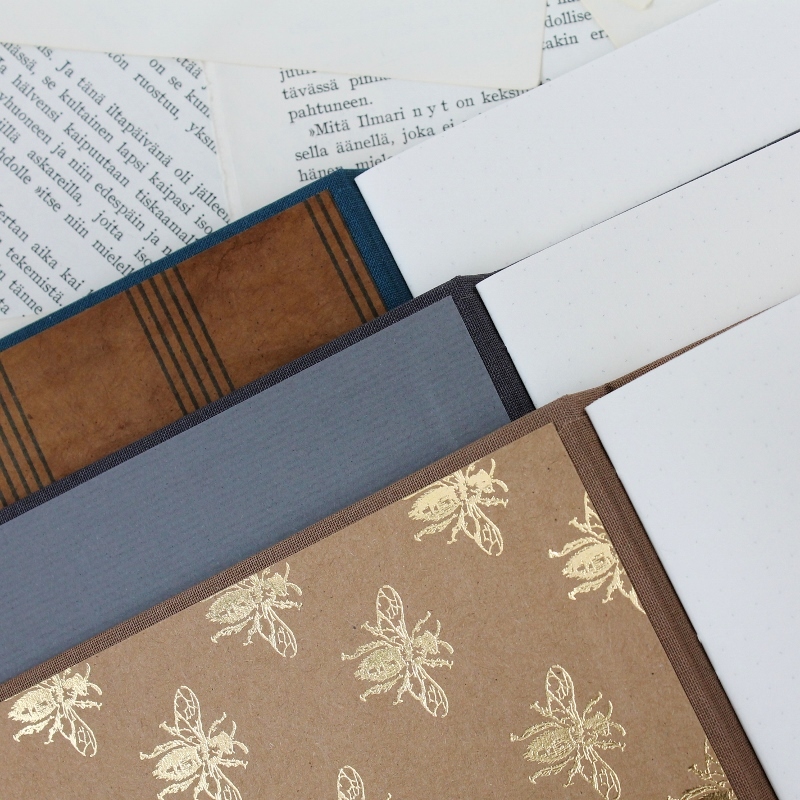 The endpapers in this trio vary from gold print to solid to printed handmade paper. 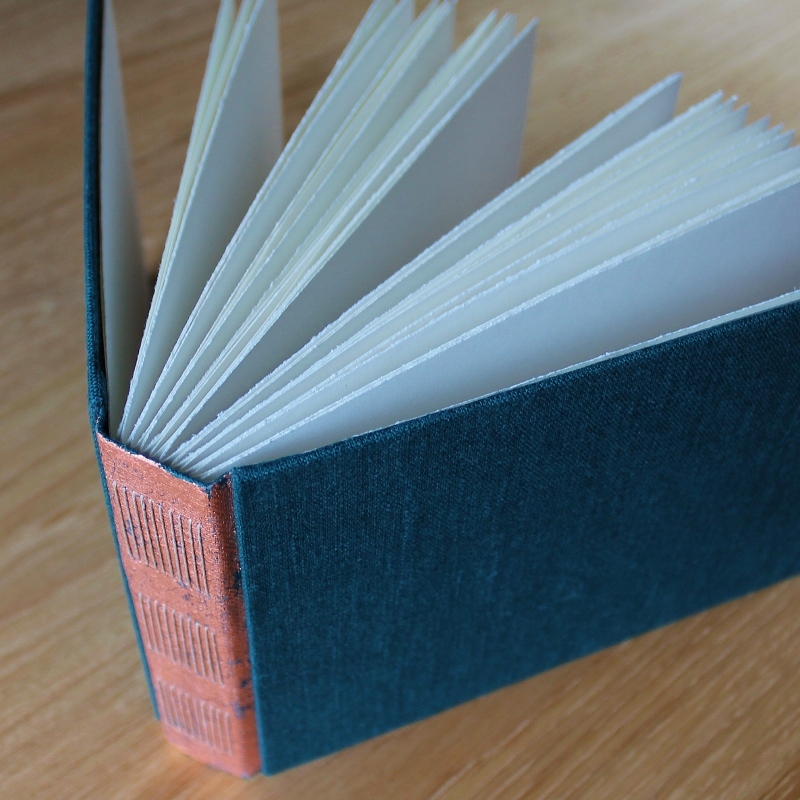 My personal favourite is the combination of teal bookcloth and teal-striped golden brown handmade paper. I should already be focusing on some fine binding projects, but no such luck. Once a procrastinator, always a procrastinator. Perhaps that's not entirely true, as my reason for putting off the fine bindings is the flurry of interest in other matters. It's not like I'm not creating new work, it's just stuff that is less dependent on deadlines. Soon I'll cut into that luscious pink leather. Soon, I promise. Just listed in the shop: a dozen new bullet journals in a dozen colours and three different long stitch style variations. I only made one in each colour, and you know the drill: once a colour has sold out, it's gone & the next lot of bullet journals will be something different. Another reason for you to rush off to shop is that I'm leaving town for a week come Monday morning, so, any orders placed after Sunday morning won't be heading out until April 11th. My birthday present to myself is a week in Helsinki: museums, libraries, poetry, artists' books, long walks, and tons of photos. While I visit Helsinki fairly often, I never stay long enough to visit more than a handful of places, and I always end up running out of time or energy. This trip should solve both problems and get me out of the home town rut I'm in. I'll probably flood my Instagram feed & stories with photos of Helsinki, so do follow along if you're interested. 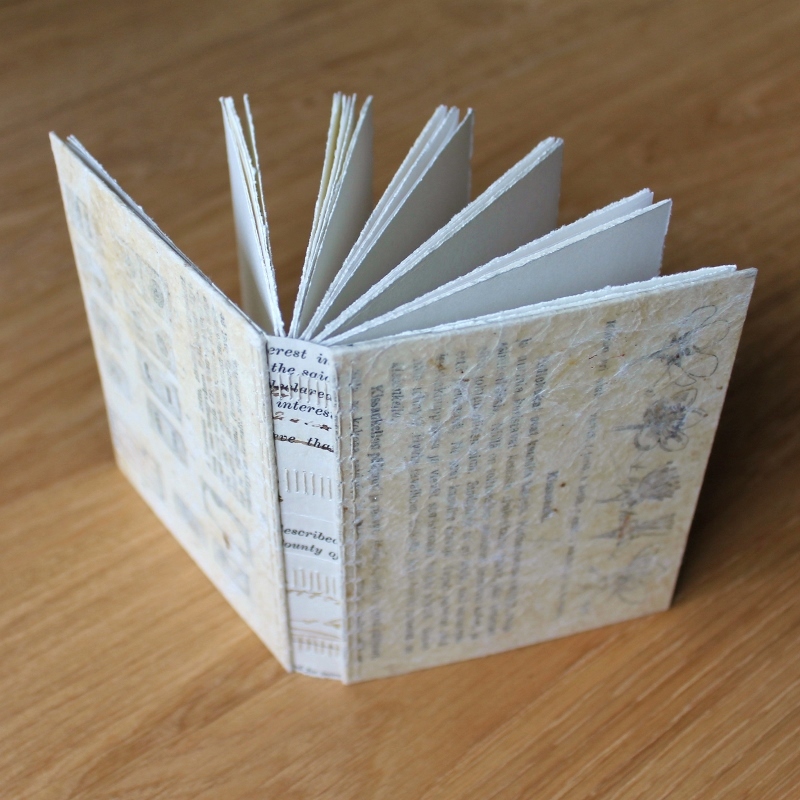 For those fully uninterested in stuff that's not books: I will be posting artists' book stuff next week as well! 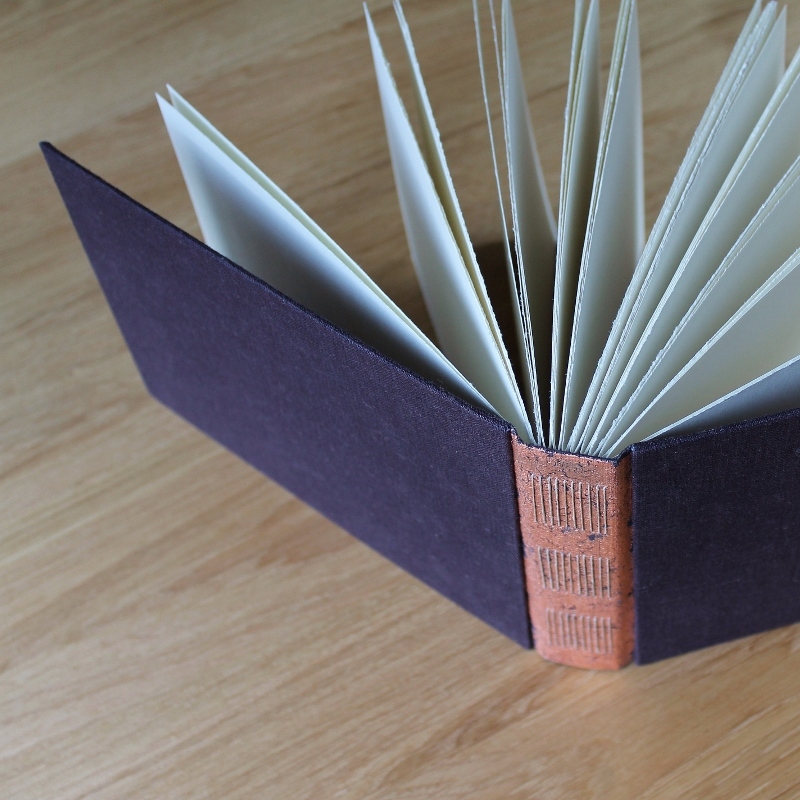 I have finished my #areyoubookenough bookbinding challenge piece in time, and you can see it very soon on Instagram, and there'll be a post here on Monday as well. Back to the bullet journals after the tourism side step: like I said, I switched things up a bit and did three different variations of the long stitch binding. The loopy chain stitch kind on the yellow and orange journals I hadn't done in a decade but I do like it a lot. Today I'm going to finish off with a quick recommendation for pretty much everyone who likes to listen to stuff as they work: the brand new (and brilliant!) S-town podcast kept me company while I glued the covers for this lot - nearly seven hours of amazing storytelling that was so good I got pretty distracted at times and forgot to keep that glue brush going. Which obviously isn't that great when you desperately need to get work done, but I'm telling you - it's worth it!